So, I am a daydreamer as my previous posts have asserted and as a child I spent many hours imagining myself into the world of fairies. Who didn’t? I knew they didn’t exist, but my imagination, as imaginations tends to do, lived in a world of what “if”, not what “is”. 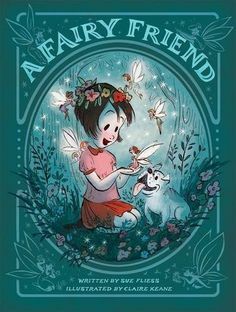 A Fairy Friend, a picture book written by Sue Fliess and illustrated by Claire Keane, took me right back to those childhood days when I fancied myself living in an enchanted world where “friendly fairies…ride the backs of dragonflies”. The book is essentially a how-to manual on how to attract and befriend a fairy: “Make her a fairy swing”, “cook a flower-petal stew”. The illustrations are whimsical and are exactly what I imagined as a child dreaming about the fairy world. I’m not sure what the author’s intentions were, but I like to think that the book is also about believing. Believing in love and hope and beauty and the magic engendered by the very act of believing. It’s hard not to give away the ending on this one because I love the ending. Suffice it to say that to me it meant that sometimes love, hope, and beauty seem to leave us, but if we keep believing, they always come back. Oh, and I think the kids will like it too!